Throughout the LP we see Savvy’s own personal and political musings. The lyrics open us up to ideas in order to provide us with food for thought, to open begin to open up our own questions, provoke new thoughts and ideas. Simply, to open our minds. The album begins with the words of spoken word artist, Lisa Luxx which pre empt the tone for this musical journey. She states: “ The world has stalled”., between tracks she guides the listener through the album. Her poetry connects the recurring themes between the tracks and works in dialogue with them. 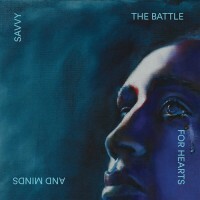 Savvy’s new LP has become both a vessel for knowledge and also a place to inspire. Interestingly, the album is a return from a long hiatus, after years of a love and hate relationship with hip hop, In the end, staying true to his original love for music, he has created a body of work that transcends mundane questions of value and claims of status to offer us a piece that is undoubtedly human. Giving a critical (albeit, uncensored) look at our flaws, our nature, our manipulation, our hopes, fears, successes, our love, hate, namely, our contradictions. He is asking the listener to follow him on this journey of questioning our own humanity and what we do with it. What we can do to better ourselves as individuals and as a society as a whole. And how we can win this battle over our hearts and minds, to achieve… What, exactly? You’ll have to listen to find out.